I flew to London this morning for the release of the Colonial administration records, which includes a tranche of documents about Malaya, Brunei, Borneo and Sabah. First of all the disappointments. There is nothing about the 1948 Batang Kali incident, when a platoon of Scots Guards murdered 24 Chinese villagers, which implies that relevant records were destroyed at some point after independence. 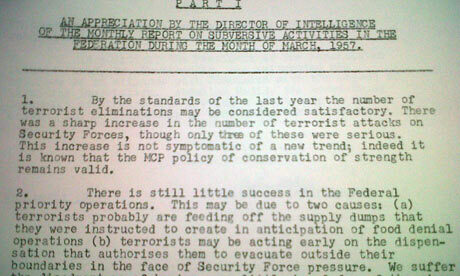 This fact alone suggests that the British administration in post war Malaya concluded that they had a lot to hide. ...if there were to be a government inquiry or litigation, the British government would find it very difficult, if not impossible, to produce evidence in its defence because it either failed to keep a record at the time or has destroyed it since. In FCO24/851 there is a brief but telling comment by an FCO official who had drawn a blank when asked to call up the relevant papers at the time of the Healey inquiry in 1970. 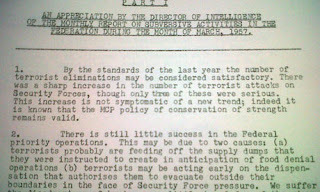 The official reported that the Colonial Office file on the Batang Kali incident had been destroyed under the provisions of the Public Records Act 1958, since 'it was apparently considered at the time it was reviewed [probably in 1966] as not being worthy of permanent preservation' and he added: 'This is, of course the fate suffered by most of the C.O. files on law & order in Malaya during the Emergency.' I had hoped that the 'migrated archives' would prove me wrong but, after last Wednesday's introduction to them, I remain pessimistic. Some weeks ago, I simply inserted 'Massacre in Malaya' into the NA search engine - and came up with two files, which should appear here. When I tried to order these files, a message appeared stating that they were 'out to a government department'. I assume the files are being studied prior to the trial in May at the Royal Courts of Justice. I know they contain the 'confessions' of the Scots Guards veterans who went to The People newspaper following Foreign Secretary George Brown's obfuscating comments about the possibility of a 'British My Lai'. The archivist who introduced the release of the formerly secret colonial records made an interesting distinction between archival gold bullion and gold dust - the former being a ground breaking revelation, the latter demanding careful sifting of data. It looks as if the latter strategy will be required with the new Malayan releases. This Guardian report refers to files - which at the time of writing I have yet to locate - that describe the elimination of 'Communist terrorists': Casualty tables written for December 1956 record: "Ranking terrorists eliminated – 8." The phrase "eliminated" is used repeatedly to describe the killing of insurgents. In January the following year, Madoc recorded: "In Selangor a small but important success was achieved when the whole of the Ampang branch, on the outskirts of Kuala Lumpur, was eliminated." As historian Karl Hack commented when I met him at the Archives, these are hardly revelations.